Culture > Traditions > Springtime & Easter in Scandinavia! Springtime & Easter in Scandinavia! After the long nights of winter, Easter and the arrival of spring are truly celebrated in Scandinavia. Whether they spend their Easter holidays in the city welcoming the return of the spring flowers or they escape to the mountains taking advantage of the longer spring days to get in the last of the season’s skiing, Easter is a time of renewal for Scandinavians, celebrated with good food and good company. No matter what the setting, Scandinavians are known for their hospitality and charming table settings. Their colorful and coordinated tables make the time spent with family and friends more memorable. Fresh flowers, festive napkins and, of course, candles add to the spirit of these gatherings. To celebrate Easter with the flair of the Scandinavians, look to Ingebretsen’s for our large selection of candles and quality paper napkins as well as our year-round array of colorful Swedish table linens. Sit down and enjoy a traditional Scandinavian breakfast. Try the Finnish Pulla Braid topped with Gjetost or Cloudberry Preserves. Olof Swedish crisp rolls are the perfect accompaniment to soft-boiled eggs. Top it all off with a good strong cup of Swedish coffee - perhaps Egg Coffee. The recipe for the Finnish Pulla Braid is from The Finnish Cookbook. A Påskris (Easter Tree) is adorned with brightly colored feathers and miniature Easter ornaments. A variety of hand-crafted, brightly colored ornaments are available at Ingebretsen’s. 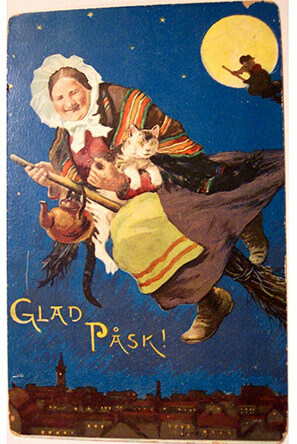 The Easter witch or påskkäringar is a Swedish tradition. It was once believed that witches were about at Easter, so all doors were kept shut to keep them out. The witch survives as an Easter motif today. Children dress up as påskkäringar with bright kerchiefs on their heads and sporting a broomstick. They go from door to door wishing all Glad Påsk - Happy Easter. And so from our store to your home, Glad Påsk!